OPA-1500W series high power single mode EDFA is characterized with low noise, high linearity. 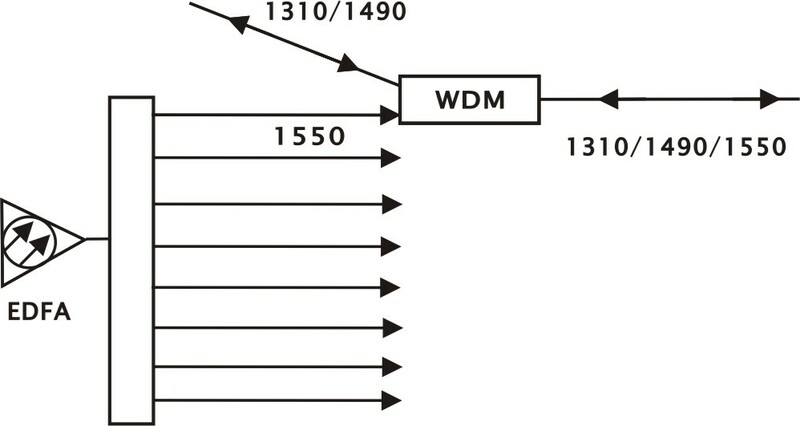 Build-in well-performed CWDM integrated 1490nm /1310nm data stream from the OLT and ONU into single fiber transmission through EDFA, reducing component count and improve system performance and reliability. It offers a flexible, low-cost solution for CATV large area coverage of metropolises and medium-sized cities. OPA-1550W series is equipped with completed APC, AGC, ATC control, excellent design for heat-dispersion which guarantees long time working and stable operation of the PUMP laser. RJ45 on the back panel offers SNMP network interface. The wide LCD displays all the parameters of the whole unit and alarming. The laser will be automatically switched off if optical power is missing; it offers security protection for the laser. All of the optical outputs are located on the front panel (can be on back panel is customer specify). OPA-1550W series adopts single mode pump, EDF and multi-pumps integration technique. Optimized for low noise, allow for clear transmission of video, voice and data signals. OPA-1550WA: 1RU chassis, total output power >500mW, 8 uplink optical ports, for OLT+8 1550nm output optical port, multiply 1310/1490 data stream. OPA-1550WB: 2RU chassis, total output power >6300mW, max. 64 uplink optical ports, for OLT+64 1550nm output optical port, multiply 1310/1490 data stream. (1) Low noise, high performance. (2) Total output power: 400～4000mW. (3) 8~64 uplink optical ports, for OLT. (4) 8~64 1550nm output optical port, multiply 1310/1490 data stream. (5) Completed with RJ45 for SNMP. This product was added to our catalog on 04/29/2016.